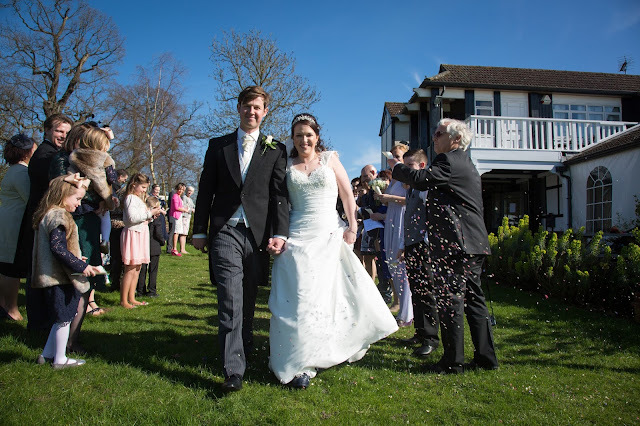 You may have seen my post about confetti whilst we were planning our wedding day, if not then you can have a look by clicking 'here'. We were sent some gorgeous samples from The Real Flower Petal Confetti Company before making our final choice on what we wanted. Obviously delphinium petals. They're Michaels favourites! They also offer a range of ways to display confetti to your guests, cones, envelopes, baskets for example but I decided I would love to have a go at making confetti cones for myself so that's what I did. I hunted everywhere for a perfect basket then decided I didn't want a basket so last minute used a shoe box - for a pair of boots I got from Hotter, wrapped it in wrapping paper and used that... Looking back I should have probably ordered a basket from The Real Flower Petal Confetti Company instead but it worked so all was good.